Vase is polymer clay…modified for effect – turned on a lathe. 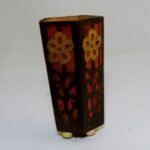 A lovely Art Deco piece OOAK..great as a show piece or a bud vase. Note: picture shows rim slanted but not in hand.